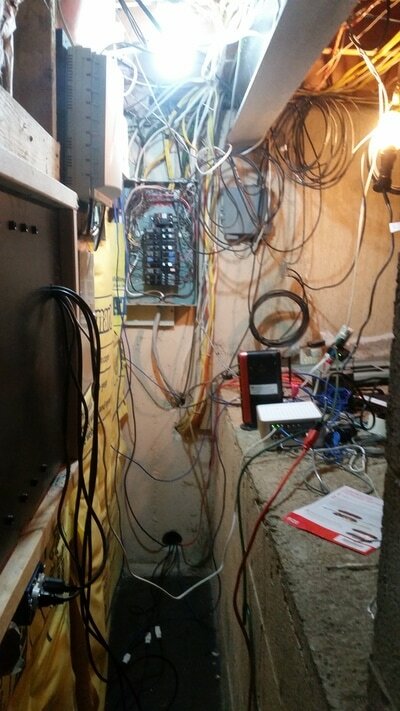 Does your Electrical service look like this? What exactly does my main electrical service consist of? Your homes electrical service consists of a few parts. First part is your outdoor service cable and meter socket. The outdoor service cable and meter socket is a critical part of the electrical service. If installed improperly or worn from being exposed to the elements for years it can cause major problems. One of the biggest issues we see with the service cable and meter socket is it was installed improperly and water is entering the service cable outside and making its way inside into your main service panel. Next is your main service panel, which distributes power to the individual branch circuits through out your home. Every panel is equipt with either circuit breakers or fuses. There are a few major issues we regularly see with main service panels. Each breaker in your panel was originally sized for the branch circuit wire that it feeds. A common misconception is that if your circuit breaker constantly trips just change the 15 amp breaker or fuse to a 20 amp breaker or fuse. By doing this it will eventually heat up the wire melting the insulation and causing major safety issues. 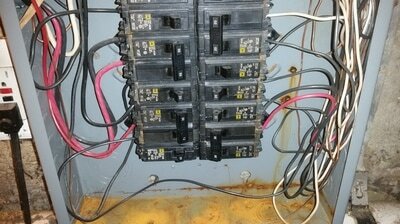 If you have a circuit breaker which regularly trips there is a reason and most likely it is because of what is being used on that circuit. Please contact us for a free consultation if this issue exists. The next issue we see is a main service panel with multiple "tandem" breakers. These breakers are pictured above. It is a breaker that takes up one spot in the electric panel but gives you 2 breakers. There are only certain panels that are rated for these breakers and if used improperly can cause a panel to be overloaded. 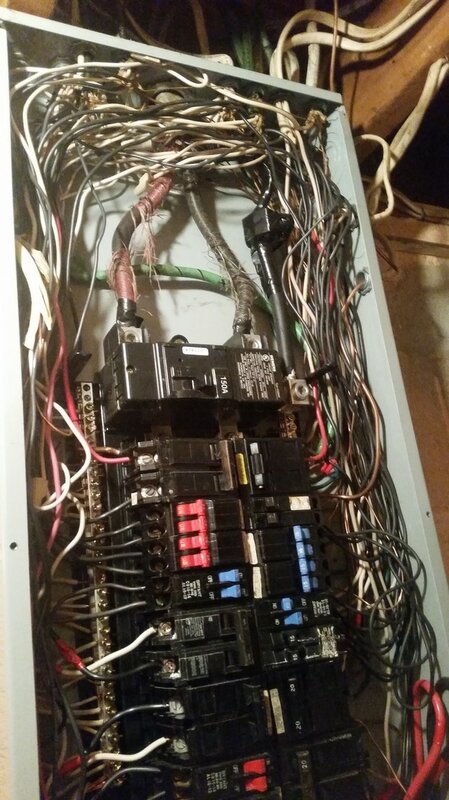 If you have never had your main service panel inspected feel free to give us a call, we will check to make sure the service is up to code and most of all safe! The next part of the electrical service which is critical but many times overlooked is the ground rods and the water bond. 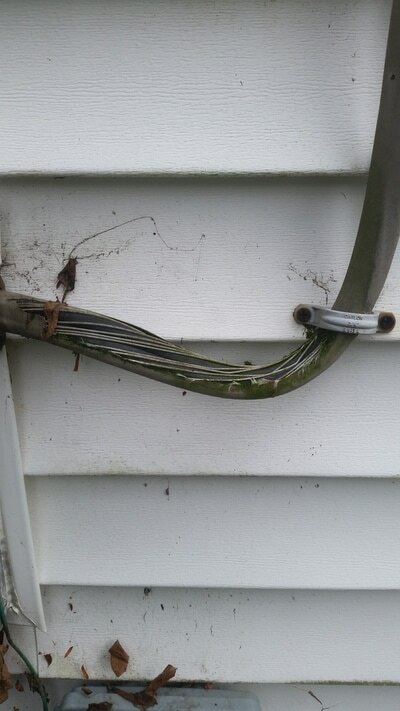 When a service upgrade is done it is required by code to install 2 ground rods outside. These are 2 8ft rods that are driven into the ground outside 6 ft apart. The ground rods are a designed electrical path to dissipate a static discharge voltage (such as Lightning) to earth. The next part is the water bond. The size of your service 100 amp, 200 amp, 400 amp determines what size water bond is required. 100 amp is a 6 awg copper wire, 200 amp is a 4 awg copper wire and 400 amp is a 2 awg copper wire. This wire is run from your main electrical panel to the spot where your main water comes in the house. It is jumped out around the water meter to protect both sides of the water service. The main purpose of this bond is to ensure that the metal water pipe is at the same zero voltage to ground as the service grounded conductor. The secondary purpose is to ensure that there is a path back to the service for electrical current flow if the metal water pipe becomes energized which will trip the breaker for associated circuit. How do i know if my service is installed properly? As a home owner you would not know if your service is installed properly or not. We offer a free consultation to come out and inspect the main service of our customers homes. If your indoor or outdoor electrical service looks like the above pictures feel free to contact us at 267-753-5687 to schedule your consultation today! View our whole house surge protector page as an add on to your electrical service. Protect your home from all forms of electrical surges today!